Another week, another great Trushmix! This week we bring you a mix from Madteo – originally from Italy, but based in Queens, New York, where he spends his time searching for 1$ gold in local flea markets and record shops in between producing brilliant tracks that can be found on quality labels such as Meakusma, Morphine and Workshop. Madteo's musical output is diverse and rather difficult to categorize – one moment deep, druggy house, the next smoky hip hop beats, but always with a kind of psychedelic, leftfield touch. His Trushmix is equally difficult to categorize, spanning both genres and decades – Whitney Houston mixed into DJ Sotofett, anyone? This is 75 minutes of eclectic brilliance for your brain AND your feet! 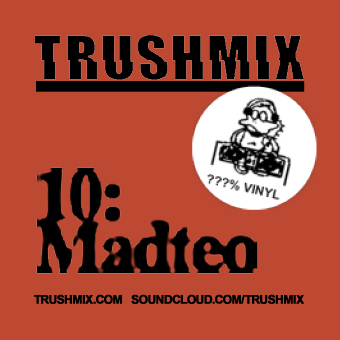 Let the madness begin - enjoy Trushmix 10: Madteo!